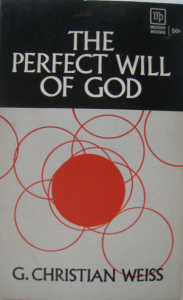 Two older devotional books that I found to be delightful were G. Christian Weiss’ The Perfect Will Of God and Vance Havner’s Rest Awhile. Weiss’ treatment of God’s will is unencumbered by today’s emotional, psychical style of writing on this subject. Don’t expect too little from this old saint. He says “Unholy people are in no position to know His will for the simple reason that they are not in readiness to do it.” Dr. Harju introduced me to Vance Havner’s writings. If you are going on a vacation or just some personal time away, try to get a copy of this book. Havner will walk you down the snowy New England lanes and have you directing music to the springtime chorus of God’s creatures. He will also bring you into the creaky old altars of little churches where giant servants melodiously lifted the Savior’s name. Worth it!